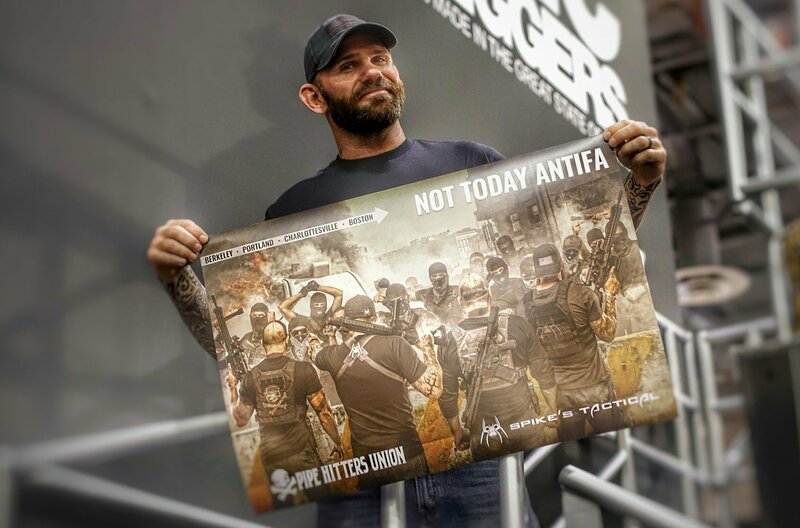 APOPKA, Fla. – Spike’s Tactical, a Florida-based gun and weapons manufacturer, kicked off 2018 with a new marketing director and a controversial advertisement, which features four armed Americans standing in defense against a violent group of “Antifa” protestors. While the advertisement, which was co-produced by Spike’s Tactical and the veteran-owned apparel manufacturer Pipe Hitters Union, has drawn both criticism and support, the controversy surrounding the ad has undeniably caused it to be seen by millions of people. Since the ad was posted to Facebook and printed in SKILLSET Magazine and RECOIL Magazine for this week’s SHOT Show in Las Vegas, stories about it have been covered by many media outlets including ABC, FOX, Newsweek, VICE News, The Blaze, MILO, Alex Jones and the Orlando Sentinel, just to name a few. Cope, a world-renowned MMA fighter and four-time Muay Thai World Champion, joined Spike’s Tactical in November after the company parted ways with their former marketing director, Ben “Mookie” Thomas. Prior to joining Spike’s Tactical, Cope served as the manager of media content for Black Rifle Coffee Company and co-hosted the Wild World of Spike on Spike TV. He also hosted MTV’s True Life for Muay Thai and for MMA.